Alarmed by the Soviet counter attack at Moscow the panzers plan to retreat but the rains cease and are followed by a hard frost. Supplies, mobility and armour fully restored the Germans plan their last hurrah! before the predicted snow fall. Finland & Army Norway: The winterized troops of Army Norway push over the frozen river in front of Murmansk with Soviet defenders pulling back intact. 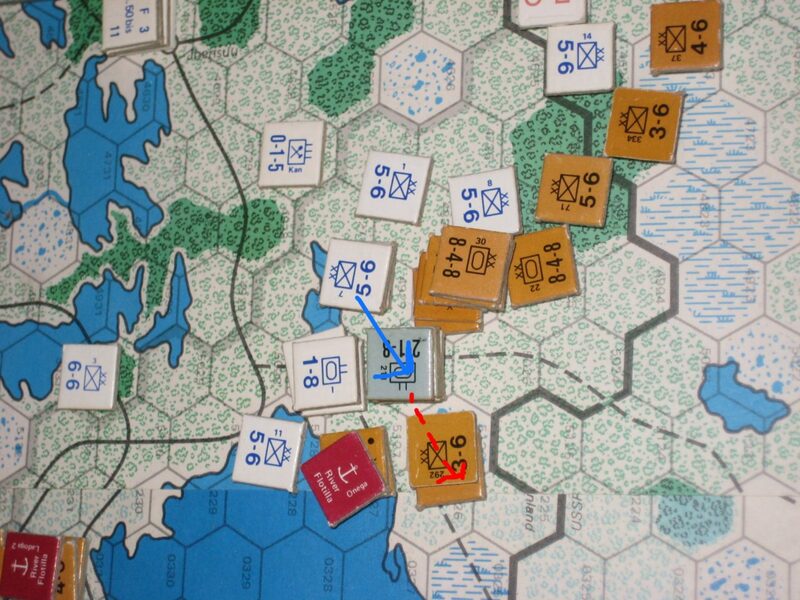 In the centre the German infantry eliminate a second regiment and push East while in the far south the Finns fail to eliminate the Soviets but gain more ground in their attack along the north shore of lake Ladoga. AGN: The Germans reduce a Soviet guard division and burst out East from the north of The Valdai overrunning the shattered remnants in the exploitation phase. In the centre of their operational zone the advance East is halted by fresh Soviet troops but the shoulder of the penetration is widened, reaching the NW outskirts of Kalinin which is temporarily placed out of supply. Nov II Axis Turn:Axis smash the line between Moscow and Tula. AGC; The panzers in the northern hook around Moscow turn inwards and push the defenders out of the NE part of the city. With horror Moscow realises that the artillery syphoned off for their own hapless attack has weakened the defenders who could not withstand the massed ranks of Panzers and newly arrived Neblewerfers. The Fuhrer’s allowance of an active retreat to the south of the city proves its worth further cementing his grip on his generals as the “retreating” panzers smash into the rear of the Soviet fortified line between Moscow and Tula. 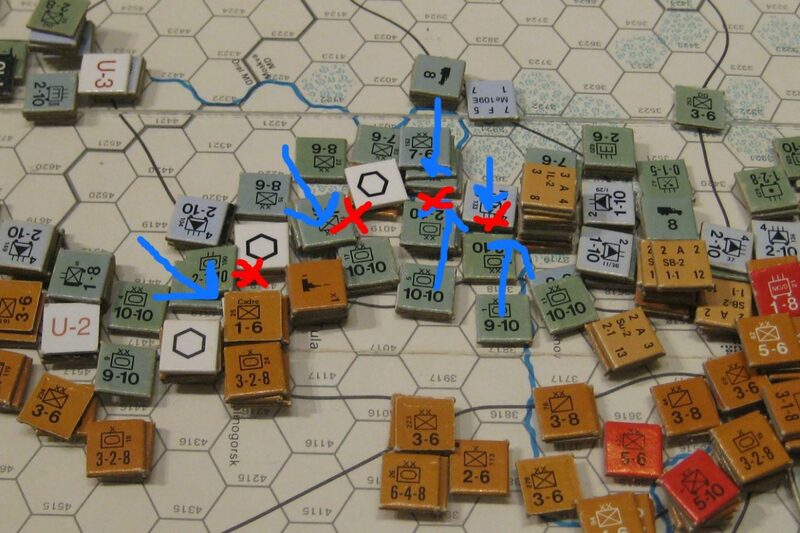 Aided by infantry arriving from the West and outflanking the river defences the line is shattered along its entire length between Serpukhov and Tula. 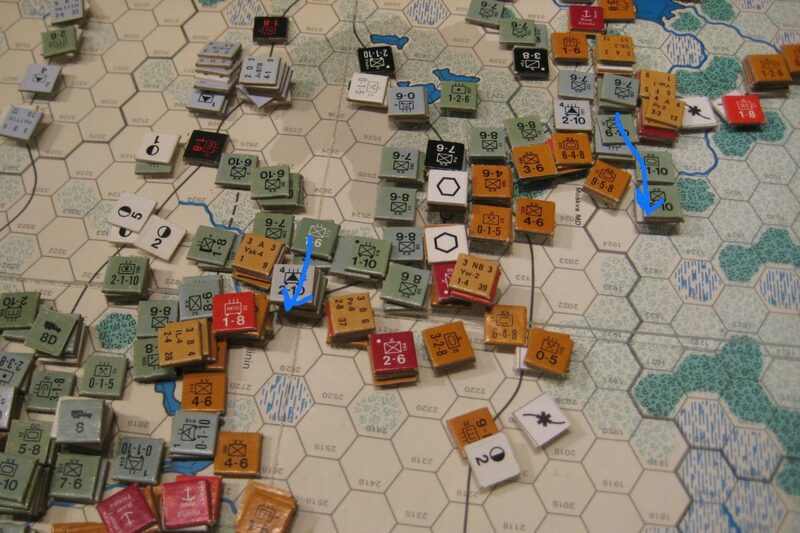 Only two surrounded and isolated fortified hexes remain of the once defiant Soviet defensive line. Immediately to the south of Tula retreating panzers and SS motorized divisions halt their retreat to hold the rail line denying the out of production Tula factory an easy escape south. 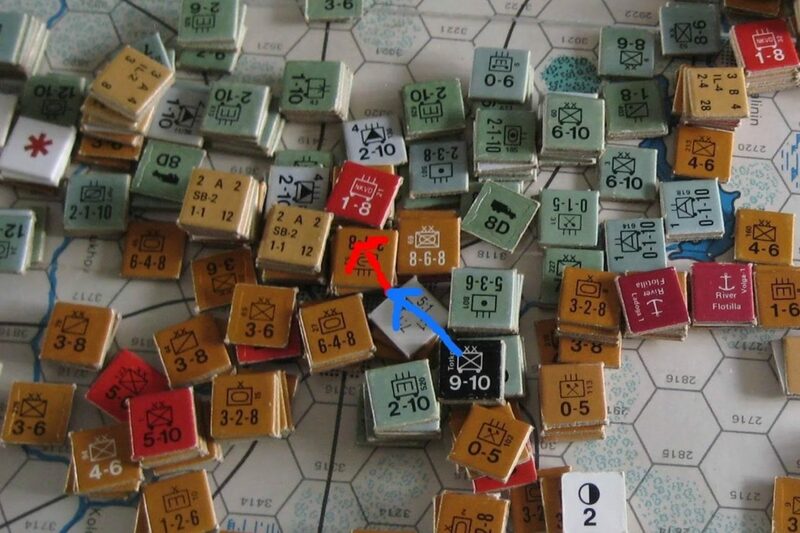 AGS: Other than a couple of spoiling attacks on over extended soviet attackers the front is quiet with the Axis moving west to avoid direct contact with the soviet line as the rains continue to prove a barrier to getting supplies to the front line troops. Only along the river to the e ast of Kharkov is the line held toe to toe with the Soviets to give separation for the besiegers. Artillery and engineering assets are moved into place to await the arrival of full supplies and rail artillery to enable an assault. 11th Army: A mixed 6 division group of Italian, Rumanian and specialist German troops move south from the storming of Zaporizhzhia to join the 11th Army in the Crimea, while the armoured elements already present concentrate on eliminating the border force at the gates of the peninsular. The Luftwaffe decide on a massive air attack on the Black Sea fleet calling in all available air squadrons. Of the 26 bombers employed 3 are driven off by AA fire and 4 hits are inflicted sinking the CLs K.Krim and Ch.Ukraine. Goering examining the situation reports decides this is an inefficient use of assets and orders no more massed attacks on this scale. Future attacks are to be directed against the port installations at Odessa which is still a defiant redoubt far to the west of the front line. Losses: Soviet Isolated = 18, Un-isolated = 45.